Curious to try jackfruit, but not sure where to start? 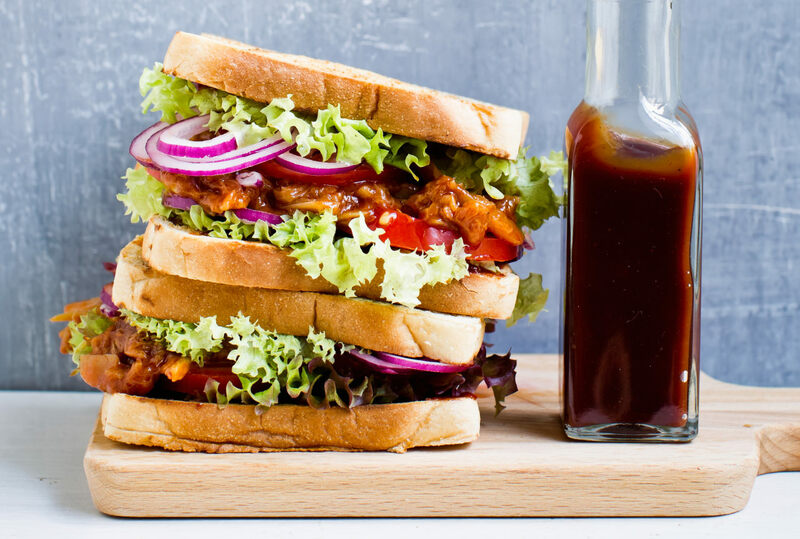 Whip up this delicious jackfruit sandwich recipe that puts a twist on a street food favourite, from Vegan on the Go. Tip: You can buy canned jackfruit in Asian supermarkets. It’s really important for this recipe to get young, green jackfruit in water or brine, and not preserved in syrup! Put the jackfruit into a sieve, let it drain well, then rinse under cold water and let it drain once again. Carefully shred into rough pieces. Heat the oil in a pan and sauté the jackfruit for 3–4 minutes over a medium heat, then season with salt. Peel and crush the garlic and sauté this briefly too. Add the barbecue sauce, stir, then cover and leave to simmer over a low heat for 1 hour. Give it a stir every so often and, if necessary, splash in some water. Season to taste with salt and pepper, remove from the hob, and leave to infuse for 12 hours. Briefly toast the sliced bread under the grill or in the toaster then spread with a little bit of barbecue sauce. Top 2 pieces of bread with 1 lettuce leaf each. Arrange the tomato, onion and some jackfruit “pulled pork” on top, then drizzle with barbecue sauce. Top with the remaining lettuce leaves and cover with the other slices of bread. Wrap the sandwiches in cling film to take with you, for a portable vegan treat!